Ahhhh….the tastes of Thailand. Like a good holiday romance, they’ll have you enraptured whilst here and desperately pining for more after you’ve left. 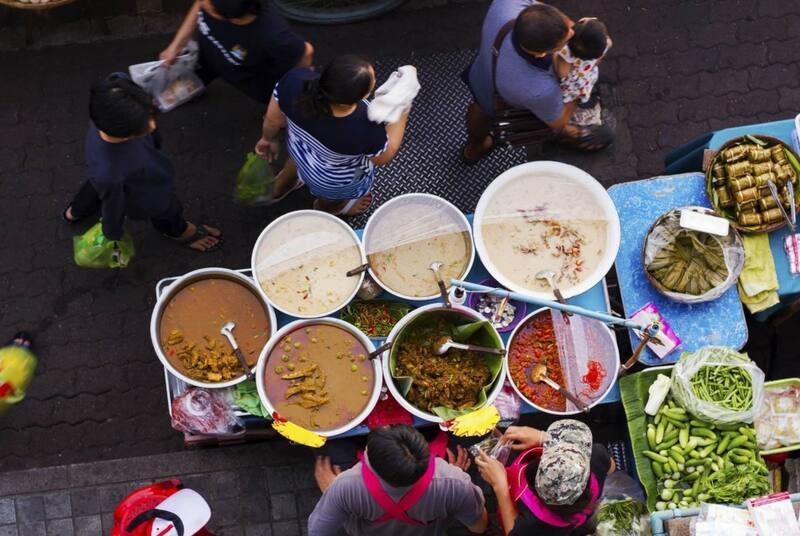 Thailand offers an immense variety of tastes far surpassing your typical Thai restaurant at home. From luscious tropical fruits to North-East Isaan cuisine and delicious desserts, you’ll encounter foods and flavors you’ve never experienced. But knowing what to try and where can be daunting. We met our food loving (& men loving) Thai guide Mr Tee at 10am in a convenient location at the Saphan Thaksin sky train station by the Chao Praya river. After a brief introduction, we set off for the “Village of Love Food Tour”. Let the eating begin! Within just a few paces we reached our first taste of the day, fresh curry puffs. Of the 6 flavors, I decided on mushroom and potato. Very good, but judging by the moans of pleasure coming from the girl who chose coconut, this would probably be my choice next time. A few steps away we washed the puffs down with Thai tea, a delicious milky sweet tea flavored with herbs. My heart skipped a beat as Mr Tee told us we were about to enter the village of love, hopeful that the man of my dreams lay just around the corner. Sadly, this was not the case. Bangkok’s Village of Love is a little less colorful than my fantasy version, comprising an area of the city popular for registering marriages and known for its food. We stopped by a small shop famous for their hand-made chili pastes, a base ingredient in many Thai dishes, and learnt a little about the history and process. After a short stroll through the markets observing daily life of the vendors and taking photo’s of cute puppies we reached our next taste, the famous Tod Mun Pla fish cake. Fresh out of the pan and topped with a sweet chili sauce, it doesn’t get better than this! Next was a dessert shop serving grandma’s secret 70 year old recipes. 5 of the shop’s famous desserts provided an array of simple but incredibly rich flavors. Feeling full already? I was, and we’d barely begun! A short-cut through the wet market and we were ready to cleanse our palates with Thai tropical fruits including tamarind, rose apple and sapodilla. Next stop was an old Thai-Chinese grocery which specializes in freshly brewed herbal drinks possessing medicinal benefits. I chose the “Black dragon” for digestion and general health, unexpectedly tasty and refreshing. With 5 gay men in the group, the topic of herbal brews for sexual potency was soon raised. The sprightly 55 year old owner (who looked in his early 40’s) presented us with a bitter, foul tasting brew to be drunk 4 times a day (reinforcing in my mind the wonders and virtues of modern medicine). Just a few doors away we sampled roast duck over rice and noodles from a restaurant which has specialized in this dish for over 100 years. And they didn’t let us down. Duck me, it was good! Next stop, one of Bangkok’s famous fried banana sellers! Whilst it may seem a simple dish, Mr Tee explained that the secret to a great fried banana is the combination of ingredients and quality of the oil, which owner Khun Jae Noy seems to get right given the long lines of locals. The sesame seed battered banana and sweet potato was a little heavy but delicious nonetheless. We weaved through some back alleys, getting a glimpse into local life, before arriving at my favorite tastes of the day, the famous Isaan dishes Som Tam (papaya salad), Laab Moo (minced pork salad) and an amazing lemon grass salad I’d never tried, lovingly made to perfection by the sweet family who ran the small restaurant. By this point everyone’s tummy was almost full (perhaps we shouldn’t have insisted on sampling Thai beer with our Isaan food…nah). We waddled to the final tasting of the tour, located inside a lovely restaurant that specializes in Royal Thai Cuisine (recipes handed down within the royal family for generations). Our final taste of the day was a Thai green curry. The taste was slightly different to the green curries I’m used to, but royally delicious. One last scoop of fresh coconut ice-cream and we were done! You cover around 2km during the 4 hour tour, not at all demanding and a nice break between bites. I particularly enjoyed the inclusion of an interesting array of local beverages and the entertaining commentary by our colorful guide Mr Tee. Even for an experienced Thai traveler such as myself, the tour was fun, informative, tasty and at only 1,200 baht (around USD35), offers great value! I’d highly recommend it.